The market is awash with flooring materials that don’t stand the test of time, but builders searching for something with durability might find that LVT is the answer, says Louisa Eyles, Commercial Marketing Manager at Amtico. It’s fair to say that when flooring materials let you down, the consequences can be very costly indeed. Wood floorboards that buckle and lift off the ground, laminate that warps or peaks along the seam, and finishes that peel and crack all lead to one thing: unhappy customers. But help is at hand in the form of Luxury Vinyl Tiles and Flooring (LVT). Long-term value and durability For builders who haven’t given LVT serious consideration before, it has a host of advantages that they might find work in their favour. The material’s strength lies in the way it is constructed. The better quality products have up to six laminated layers, plus a urethane coating, with tough upper ‘wear layers’ enhancing the product’s durability. The thickness and density of these wear layers affect the product’s length of life, and many manufacturers are able to offer generous guarantees – some products have warranties of up to 20 years. This type of vinyl is ideal for kitchens and bathrooms, as well as high-traffic areas, but remember – you get what you pay for! In addition, a super-tough top layer means that it doesn’t matter how many children or pets a household has – scuffs and stains aren’t an issue. Compare that to wood, which is prone to fading, staining and movement, and LVT starts to look like a serious contender. Added to that, the fact that wooden flooring is generally high maintenance, and needs sanding, refinishing and staining, then LVT becomes an increasingly attractive option – as all it requires is a little gentle sweeping and cleaning with specific cleaning products by the end user. But what if a client insists on a wood look for the floor? Well, LVT offers a multitude of realistic and convincing wood-effect alternatives, all with that warm, rich tone that customers crave, without any of the associated headaches of the natural product. Indeed, a large collection of wood-effect flooring options are available, in styles ranging from oak, maple and teak, to birch and walnut. You name it, there’s a product to match requirements. But it doesn’t end there – there are also ceramic tile, stone and marble-style collections, and even abstract designs if something a little more arty is required. In addition, due to availability in either tile or plank format, there are also a wide variety of laying patterns and designs on offer. LVT is also lighter than its natural equivalents, as well as softer underfoot, and more forgiving if items are droppe on it. Certain products have integrated acoustic backing for greater sounddeadening properties, and is also R10 compliant, meaning that it meets the legal standard for slip resistance. These factors alone make the material ideal for bathroom floors. Another benefit is the fact that there is only 3 per cent wastage, whereas with sheet vinyl, wastage can be up to 20 per cent. 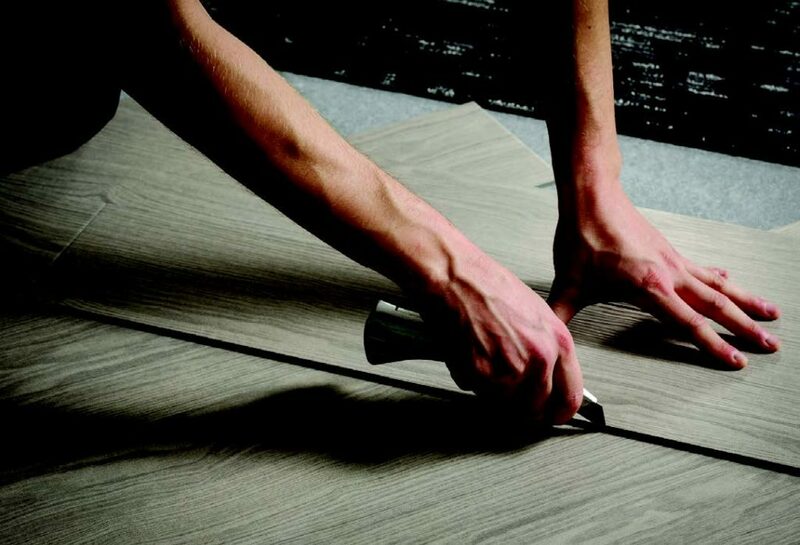 So, when it comes to installation, just how straightforward is LVT? As with any flooring, preparation is key, so it is important to ensure that subfloors, including wooden ones, are clean, dry, stable and level, and generally problemfree before screeding. Each manufacturer offers advice regarding fitting – for example, when using adhesives, these must be spread evenly with an A2 trowel, and should then be rolled with a 45kg roller after installation to flatten the adhesive ridges, and then again 20 minutes later. ‘Click’ style products are also really worth a look. This option does exactly as the name suggests, and comes with an easy-to-fit click locking mechanism, with no need for adhesives whatsoever. The majority of these products can be fitted over an existing hardwood floor and are compatible with underfloor heating.